That argument, which sounds so reasonable, makes the hair on the back of my neck stand on end. It is a classic bait-and-switch: waving health as a flag, it in fact endorses addiction for profit. The switch, you see, lies in the unstated assumption that only those already addicted to cigarettes will smoke e-cigarettes. Nocera’s claim that opposition to e-cigarettes “is costing lives” is only true given that assumption. A false assumption. Each day, thousands of teens and young adults who do not smoke cigarettes light up their first e-cigarette. Their friends are doing it, they have been told that there is no danger to their health, and Big Tobacco has made smoking e-cigarettes seem cool. So where’s the harm? The harm is chemical enslavement. An e-cigarette is a nicotine delivery vehicle, nothing more and nothing less. Smoking one delivers a measured amount of nicotine to your lungs. The problem? Nicotine is a highly addictive drug. Many if not most of those teens experimenting with e cigarettes will become addicted, just as smokers do, and for exactly the same reason. Many are going to find, when they try to quit, that they can’t. Addicted to the nicotine delivered in e-cigarette “smoke,” they simply will find it too difficult to overcome the habit. Most studies indicate a cigarette-smoking ‘quitting’ success rate — at least two year’s abstinence — of about 20 percent. Think about it: that’s an 80% addiction rate to nicotine. The chemical nature of nicotine addiction is a tragedy but not a mystery. Scientists understand nicotine addiction quite well. Individual nicotine molecules attached themselves to a key protein on the surface of brain nerve cells that act to “fine tune” the sensitivity of a wide variety of other brain activities to chemical signals within the brain. Adjusting particular sensitivities up or down to slow some activities, speed others, this protein is responsible for overall coordination of the brain’s activities. By artificially stimulating the system normally used by the brain to coordinate its many activities, nicotine alters the pattern of release by nerve cells of many chemical signals, called neurotransmitters— like turning up the setting on a TV remote that controls many television sets. As a result, changes in level of activity occur in a wide variety of nerve pathways within the brain. These changes are responsible for the profound effect smoking has on the brain’s activities. Addiction occurs because the nervous system responds piecemeal to nicotine’s fiddling with its central control. The brain attempts to “turn the volume back down” by readjusting the sensitivities of each kind of activity to its signals individually, eventually restoring an appropriate balance of activities. 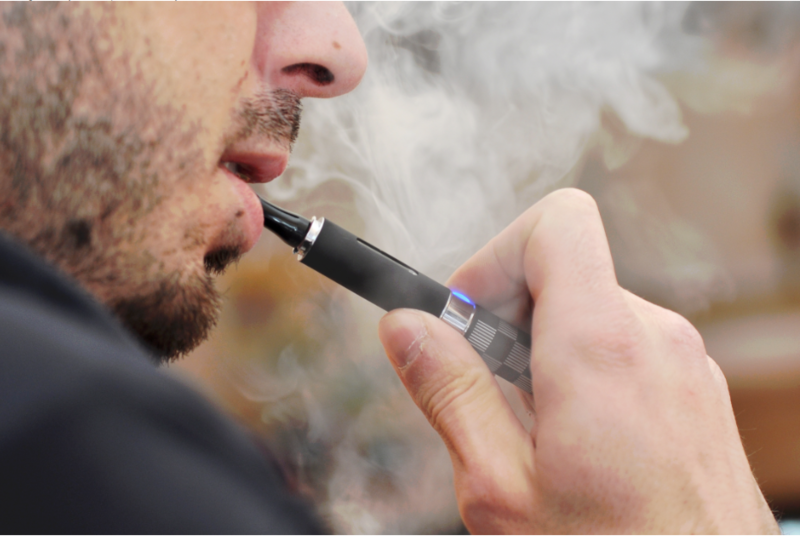 Unfortunately, these readjustments may occur after only a few e-cigarettes. Now what happens if you stop smoking e-cigarettes? Everything is out of whack! The newly coordinated system now requires nicotine to achieve an appropriate balance of nerve pathway activities. The body’s physiological response is profound and unavoidable. You are addicted to nicotine. There is no way to prevent this addiction with willpower, any more than willpower can stop a bullet when playing Russian roulette with a loaded gun. If you smoke e-cigarettes for long, you will become addicted. When a teen starts smoking e-cigarettes, he or she is signing on to contribute significant amounts of money to the tobacco industry for years to come. No wonder the tobacco industry promotes e-cigarettes. Instead of curing your nicotine addiction, they chain you to it. So what do I think should be done about e-cigarettes? I think we must address the assumption implicit in Joe Nocera’s argument: while allowing adult smokers to switch to e-cigarettes, the federal government should restrict their availability to teens. We have just this restriction with alcohol, not a perfect protection (which of us didn’t manage to sneak a beer as a teen) but on the whole very successful. No one likes government intrusion into our private lives, but surely restricting availability to teens is preferable to their financial enslavement by Big Tobacco. In effect, they are selling cigarettes to our kids without the need to produce tobacco – they won’t sell them the more deadly product so long as they still make the same money. What they are selling – what they have always been selling – is addiction. For those they have already ensnared, e-cigarettes make sense. Selling them to anyone else should be a crime.